The Temple Bell: Hermetic Antidotes to Modern Problems | Robert Mitchell Jr. 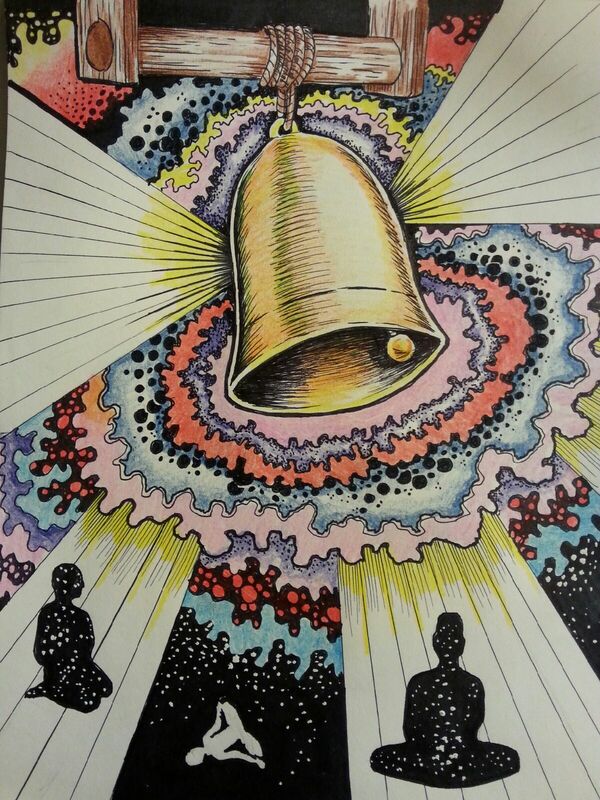 Whether you are in the East or the West, in a church, shrine or temple, the ringing of the bell is the first phrase in a conversation between the universe, the space, and all the people who hear. During a contemplation session last week I was struck by a bolt of insight into the problem of political polarization and extremism, and the remedies that came to me had a great deal to do with communication — how we talk with one another in the world today. I’m no expert in International Studies, Political Science, Sociology or even Psychology. I could be way off base. But what I saw makes so much sense to me that I humbly present it here for your consideration. People who feel threatened by increasing modern pressures — economic, climatic, spacial and social — seek refuge in past securities. Our ever-changing world, complete with social media, increasingly fast travel and communication, and dizzying technology, causes disoriented people to reach our for the stability of the way things used to be, to find solace in the traditions of their forefathers, and to generally turn away from the future and look to the past. This is why there are so few extremists who are futurists. Most extremists are fundamentalists trying find their balance in what they perceive as a topsy-turvy world. They are, for the most part, people trying to preserve a way of life that is in the process of passing away. Most of us have at some point owned an insulated bottle of some kind. These wonderful inventions are excellent for keeping things hot or cold. However, most of us have also discovered to our dismay that if the bottle is left forgotten in the bottom of a bag, backpack or purse for a few days, removing the top can be an unpleasant experience. In fact, even if an insulated bottle is promptly washed and dried after use, simply storing it with the lid sealed tight can result in the eruption of a sour, unpleasant smell when the “clean” bottle is opened. This is because there is always just a little biological matter left inside. It doesn’t take long for the aerobic bacteria use up all the oxygen inside the closed container, leaving the perfect environment for anaerobic bacteria to take over. This doesn’t happen if the bottle is stored with lid off. Anaerobic bacteria find it hard to thrive in the presences of ample oxygen. The same thing happens to insular groups. When groups are closed off from the rest of society, moderate voices die off leaving only the most extreme voices within the closed container. Physical attacks against insular groups can only be attempted when the container exists in the real world, and even then, it feeds more anaerobic growth in the virtual container of the internet. In other words, when an extreme group exists as a physical unit — for example a group of terrorists takes over a village or builds a military compound — it can be attacked and the extremists liberated, assimilated, arrested or killed. The physical container in which the extremists are contained, in which extreme ideas and activities are incubated, is smashed and oxygen is introduced. Unfortunately, as we have seen so often, extremist groups on the internet seize on these interventions to make martyrs and heroes out of the fallen, which in turn feeds more extremism inside an affiliated virtual container, which then creates new members of virtual groups who are eventually radical enough to take action in the physical world. This life cycle is akin to that of a hookworm. The creature must pass through the human gut in order to reproduce, and extremists must pass through their online groups before they take action. Thus we cannot hope to dissipate polarizing, extremist ideas in just one realm or the other. We must take simultaneous, ongoing action in both worlds. Virtual political groups, or “noetic polities,” are now more significant than physical political groups, or what we used to call “city-states.” Noetic polities form online, inside various forms of social media, and create their own versions of reality. With viewpoints uncontested, insulated from external experience and evidence, and fixated on the needs and wants of their particular group, noetic polities are the norm. People make “friends” and share “likes” with those whom they agree. You may have a “friend” in your virtual network who has opposite political opinions for a short time, but eventually he or she will exit your group and join another one in which views are shared. This is why we can’t compare curated media — newspapers and television — to the internet. An individual cannot control what is in the newspaper or on the television. You can’t “unfriend” the Washington Post. But you can choose to get your information from just one or two sources and unfriend anyone who disagrees with what you post and share. Few of us really know how our physical neighbors feel about political and/or social issues. No longer can we be assured that everyone in our country shares the same political and social mores. It is however quite likely that the majority of the individuals in our virtual circles do. Each of us is a member of a noetic polity of our own creation and curation. When noetic polities band together and become large enough they may dare to burst onto the physical scene. Sometimes when this happens it is a terrible shock to members of other noetic polities. This is because, although these groups are co-mingled in the same city, state or country, neither knew the other existed because there are 10,000 miles of virtual distance between them. For example, many were shocked in 2014 when ISIL seemingly appeared out of nowhere and began seizing real estate. In actuality the group had been around since at least 1999 in both the virtual and actual worlds. her·met·ic: From the name of the mythological figure Hermes Trismegistus and/or Greek God Hermes whose name likely stems from the Proto-Indo-European root –s(h)er “to bind or bring together.” Of or relating to an ancient occult tradition encompassing alchemy, astrology and, most importantly, the power of sacred geometry and symbol. As we’ve seen, insulated groups are breeding grounds for the bacteria of negativity, selfishness and even violence. In order to break the life-cycle of extremism and prevent its growth, we must focus on breathing oxygen into insulated environments where extremism grows — in both virtual, noetic polities and in the physical world as well. This approach is not new. Hermeticist John Dee dreamt of stopping religious war and strife. In his day there was no internet. He sought to use instead the imaginal realm of symbols. His hope was to uncover the Perennial Wisdom, the original prehistoric religion of man, and to unite the world beneath its grand symbol, the Monas Hieroglyphica. The essence of Hermeticsm is the reconciliation of opposites and pursuit of non-dualism. This kind thinking promotes the dissipation of conflict. Seek to emulate Hermes, the messenger. Hermes was the messenger between gods, and between gods and humanity. Take ownership of your role as a reconciliatory figure. Create opportunities for cross-pollination. Regardless of social and political differences, maintain virtual connections with family members, coworkers, neighbors and members of other physical circles. Be inclusive. Avoid arguments when interacting with people possessed of opposing views. Rather than focusing on winning, convincing, persuading, etc., concentrate instead on breathing oxygen into a toxic environment. Deliberately join insular social networks and inject oxygen into the dialogue. Reward positive behavior, ignore the negative, and propagate positive memes. Move the trend needle in the direction of the positive and peaceful. Observe the Golden Rule online. Where discourse involves no risk of physical injury (“sticks’n’stones”) observe the Golden Rule in discourse. Never disingenuously infiltrate a virtual group to troll, discredit, smear, promote mischief, or be evil. This kind of behavior only encourages groups to despise and distrust outsiders. Try to make fearful, disoriented people feel safe and comfortable. Observe the Brazen Rule in the physical world. As Confucius said, “Repay kindness with kindness, but evil with justice.” This method of behavior modification has been proven effective by scientific research (I was first exposed to it in a 1993 article by Carl Sagan called A New Way to Think About Rules to Live By). Be aware of the relationship — the flow — between virtual and actual reality. It solves nothing to oppress voices in one realm or the other. This only encourages the oppressed to seek refuge in an alternate reality. Remember, it was probably fear and oppression (real and/or perceived) that made these people seek out an insular group in the first place. Take part in the respiration. You cannot hope to influence someone else if you will allow no possibility of being influenced yourself. Put on your listening ears and practice empathy. In summation, I would like to call upon everyone to be realistic about the world we live in. The threat of polarization and extremism, while real and deadly, should not be feared out of all proportion. Life expectancy is at its highest point and the world remains more peaceful and safe than it has ever been at any point in history. This entry was posted in Mysticism, Writing and tagged extremism, temple bell. Bookmark the permalink.